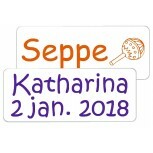 Ik heb de labels net binnen. Gewoon zoals ze moeten zijn. En de reclame die ik op de linkerzijde gewend was, is er gelukkig niet meer. Geweldig leuk deze website. Small Iron-on Labels. 1 Line text of your choice. White, Uni Color or Trendy partly colored. These beautiful soft polyester/cotton, almost indestructible iron name labels can be removed also when textile changes from ownership. 30 or 50 pcs. 30 pcs. 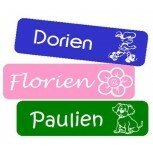 Handy permanent iron-on name labels: durable and soft flex material. 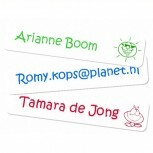 Very trendy and original iron-on namelabels: durable and soft flex material. 30 pcs. Easy applicable iron-on namelabels: durable and soft flex material.